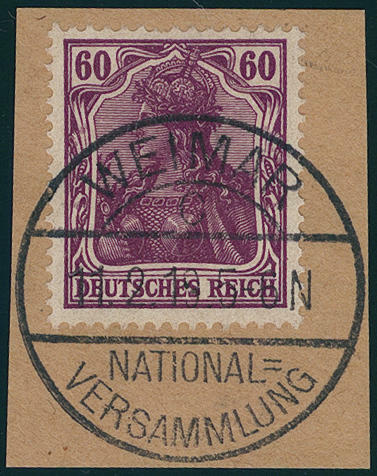 4682 ∆ 84/93II Germania set, war printing, all 10 values uniform on beautiful outstandig quality pieces, single perfect used \"WEIMAR inland Meeting 11.2.19. \". A dream set for your highest requirements! 4683 85/86IIVP 5 Pfg. And 10 Pfg. 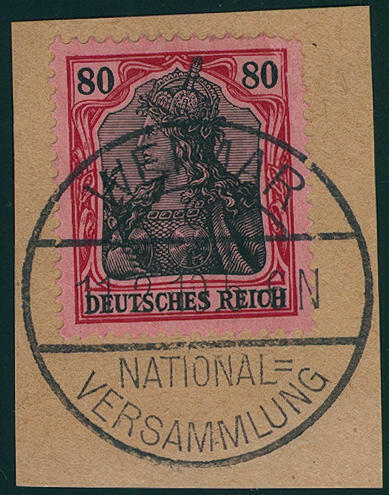 Germania, both values as unperforated trial impressions on ungummed paper unwatermarked from the left respectively right upper corner of the sheet in the plate printing. Very decorative and rare in this form! (upper margins are in the Michel special catalogue by of this issue still unlisted). 4684 85Ib 5 Pfg. 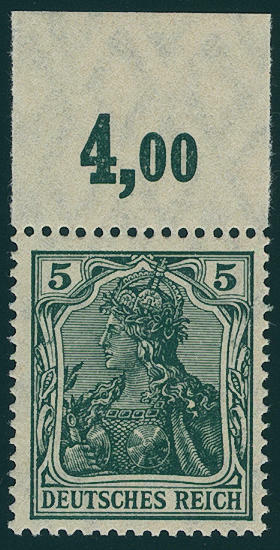 Blackish emerald green, peace printing, vertical pair from right margin of sheet with house order number \"3615\", fresh colors, unfolded and in perfect condition mint never hinged, without any signs. Pairs with this good colour with this house order number are rare. Photo expertize \"faultless mint never hinged condition\" Jäschke-Lantelme BPP. 4685 ✉ 85II 5 Pfg. 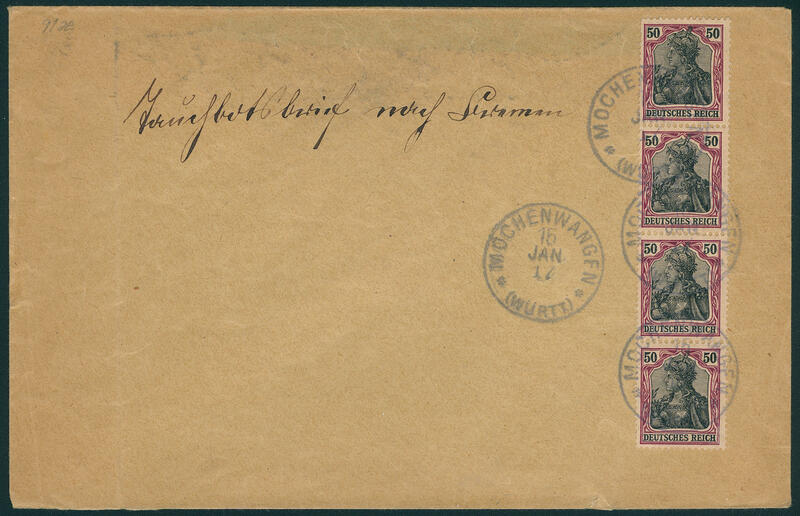 Germania, war printing, vertical strip of four on scarce ballots cover from \"KORONOW\" from the year 1920, dispatched from magistracy to Stronnau and again return sent with on the back closing slip of paper the imperial regional Directorate of Post Bromberg, as usual traces of usage, an extraordinary cover! 4686 85IIaDD 5 Pfg. 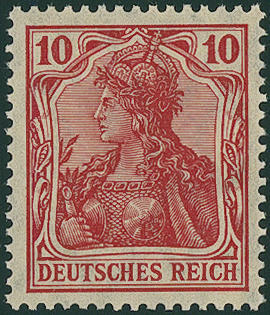 Germania with very scarce double impression, fresh colors and very well perforated, in perfect condition mint never hinged, without any signs. 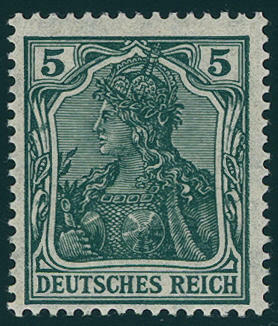 An especially nice copy this Germania rarity! Photo expertize \"faultless mint never hinged condition\" Jäschke BPP. 4687 85IIaDD 5 Pfg. 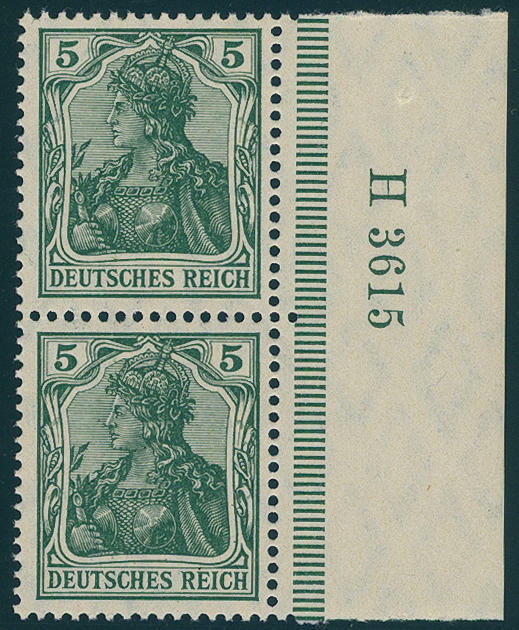 Germania with very nice double impression from left margin of sheet (also the border bar is double printed), fresh colors and very well perforated, in perfect condition mint never hinged, photo expertize \"faultless mint never hinged condition\" Jäschke-Lantelme BPP. Michel 900,- €. 4688 85IIaWU 5 Pfg. 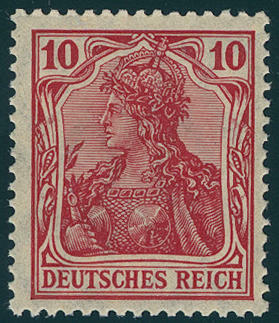 Germania unperforated watermarked \"cross and rings\", fresh colors and with wide margins, in perfect condition mint never hinged one of the large rarities the Germania period, like they especially in mint never hinged condition hardly ever to be on offer can and in almost all collections is absent. Photo expertize \"the condition is perfect\" Dr. Oechsner BPP. 4689 85IIe 5 Pfg. 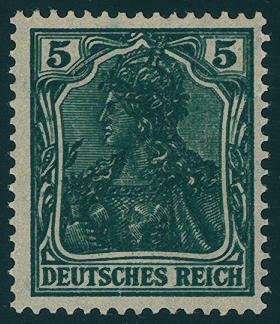 Black opal green, war printing, fresh colors and very well perforated, in perfect condition mint never hinged, expertized Dr. Hochstädter BPP. Michel 400,- €. 4690 85IIePOR 5 Pfg. Black opal green, war printing, upper margin copy, very well perforated, fresh colors, unfolded and in perfect condition mint never hinged (also in the margin of sheet), expertized Zenker BPP. Michel 500,- €. 4691 ✉ 86I 10 Pfg. 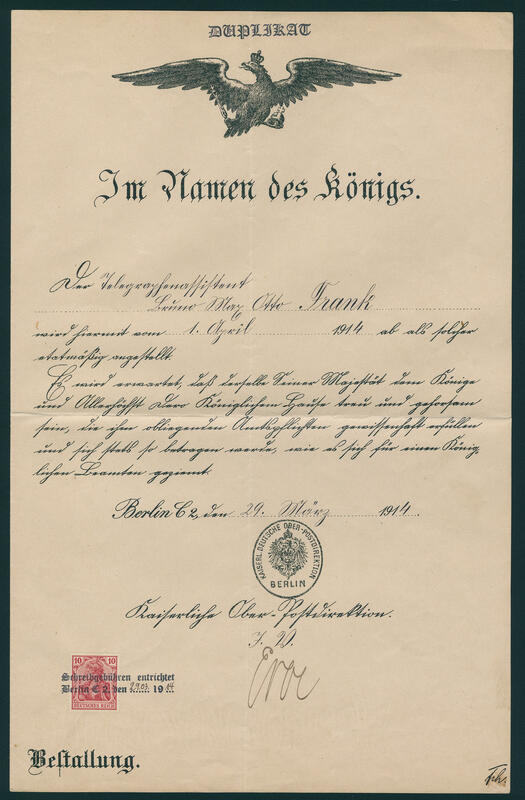 Germania, peace printing, fresh colors and in perfect condition as a single franking on dupe of an employment contract for an administrative assistants the imperial post in Berlin with two line cancel \"copying fees pays BERLIN C2 the 29.3.1914\" and seal of office \"Imperial German upper Postal service direction BERLIN\". An extraordinarily decorative and extremely scarce utilization. 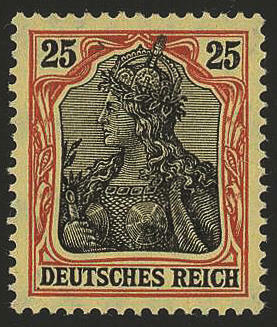 In this kind a top piece the postal history of the German Reich and a Honor for the sophisticated Germania special collection! 4692 86Id 10 Pfg. 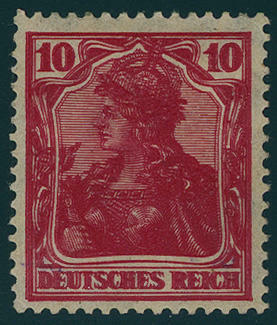 Dark rose red, fresh colors and very well perforated, in perfect condition mint never hinged, expertized Dr. Oechsner BPP. Michel 500,- €. 4693 86Id 10 Pfg. Orange red, peace printing, fresh colors and well perforated, in perfect condition mint never hinged, without any signs, photo expertize \"ERROR-FREE mint never hinged condition\" Jäschke-Lantelme BPP. Michel 500,- €. 4694 86Id 10 Pfg. Orange red, peace printing, fresh colors and very well perforated, in perfect condition mint never hinged, photo expertize \"faultless mint never hinged condition\" Jäschke-Lantelme BPP. Michel 500,- €. 4695 86IdPOR 10 Pfg. 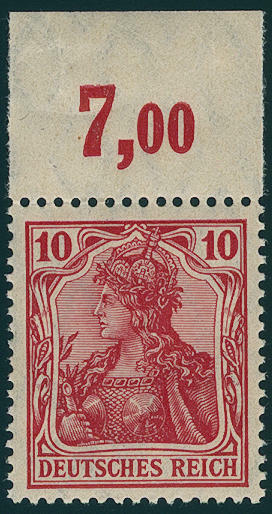 Orange red, peace printing, upper margin copy, fresh colors and very well perforated, unfolded, in perfect condition mint never hinged (also in the margin of sheet), without any signs. 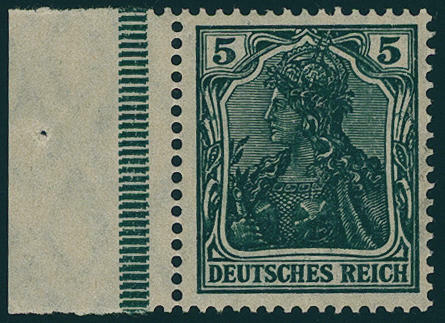 An especially nice copy this Germania rarity for the highest standards! Photo expertize \"faultless mint never hinged condition\" Jäschke-Lantelme BPP. Michel 1600,- €. 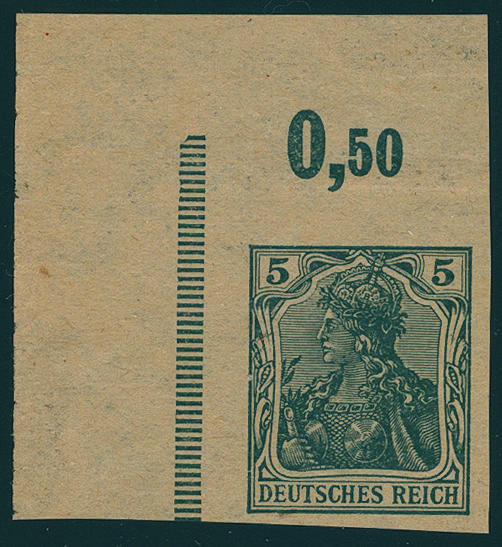 4696 ✉ 86II German Reich, 10 Pfg. 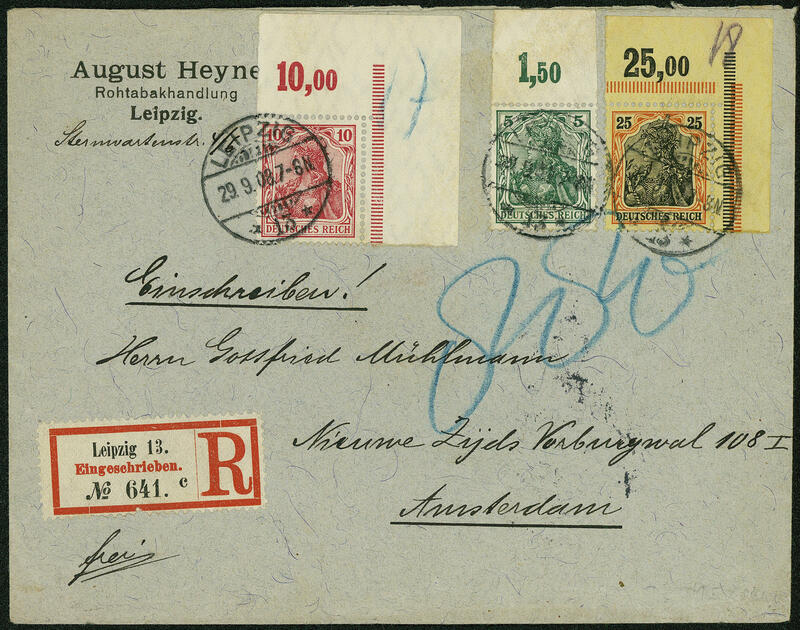 Germania in the vertical pair on very decorative submarine cover from \"MAGDEBURG 14.1.17\" with routing indicator \"VIA SAN FRANCISCO\" and censorship stamp \"Q\" to Hankow / China addressed with two ring cancel \"BREMEN D. O. R. 18.1.17. \" and three line \"return because Attitude of the submersible letter traffic return to sender\". 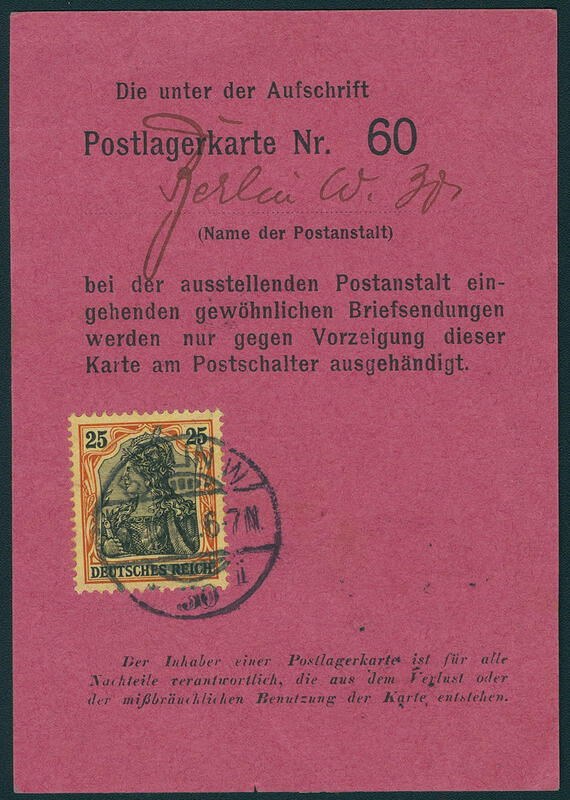 The first trip with civil post was by the entry into the war the United states no longer implemented. Covers with the destination China are extremely rare. The here offered cover possesses even still the complete content. 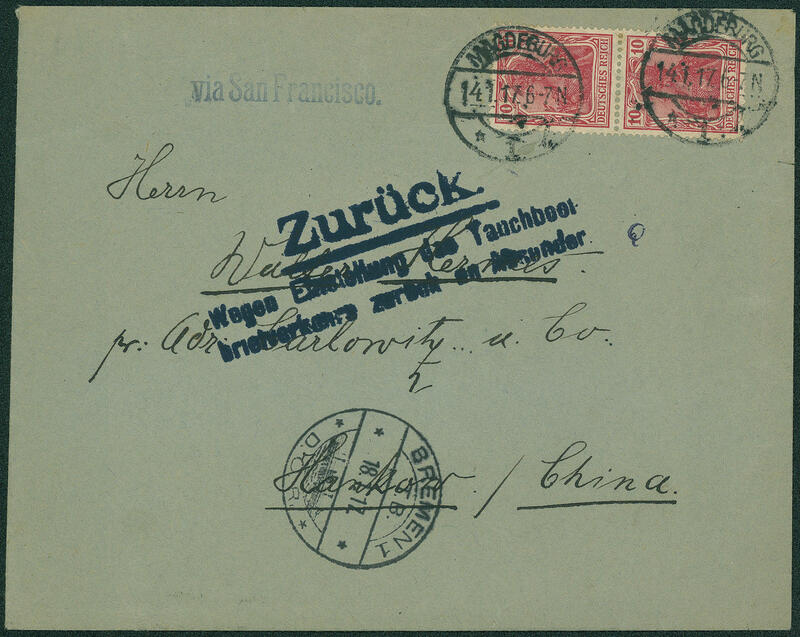 A postal history very interesting copy for the sophisticated China special collection. Photo expertize Jäschke-Lantelme BPP. 4697 86IIaDD 10 Pfg. Germania with clear double impression, in perfect condition unused, photo expertize \"faultless condition\" Jäschke-Lantelme BPP. Michel 350,- €. 4698 ✉ 88I 25 Pfg. 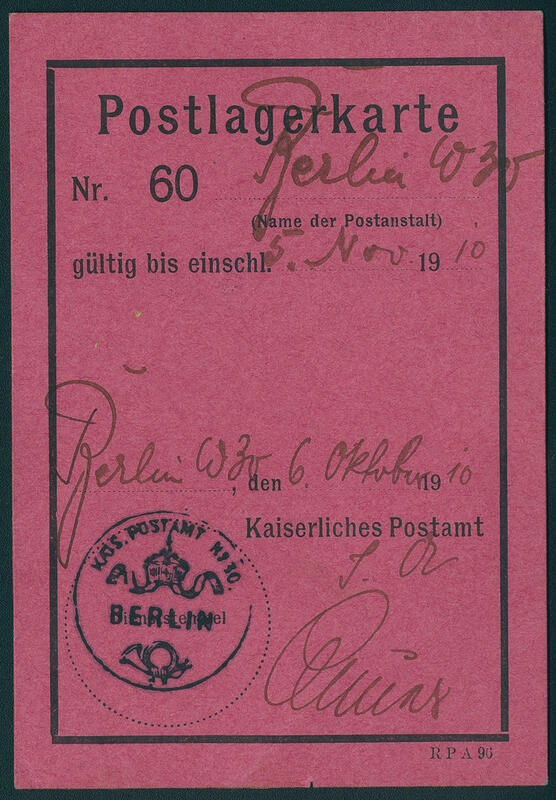 Germania, peace printing, fresh colors and in perfect condition as correctly franked single franking on very nice general delivery card with clear two ring cancel \"BERLIN 6.10.10. \" with seal of office \"KAIS. Post office BERLIN\". An extraordinarily scarce utilization in outstanding quality! 4699 88IIa 25 Pfg. Reddish orange on yellow white / black, metallically shining, war printing, wonderful having bright colors and excellent perforated, in perfect condition mint never hinged outstanding quality, without any signs. 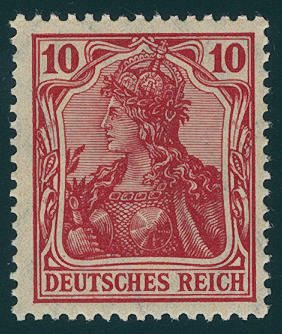 Of an of the most beautiful known examples this large German Reich rarity for your highest requirements! Photo expertize \"faultless mint never hinged condition\" Jäschke-Lantelme BPP. 4700 ✉ 88IPOR 5 Pfg., 10 Pfg. And 25 Pfg. 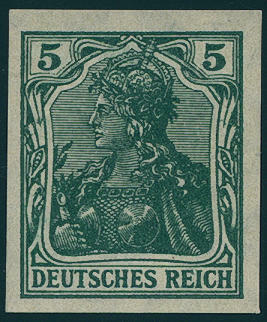 Germania, peace printing, as well the 5 Pfg. 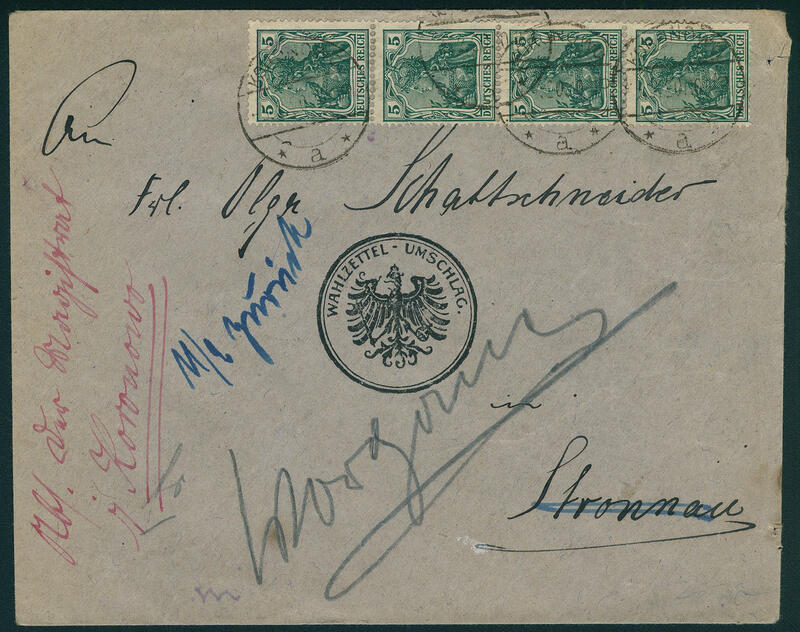 From upper margin, as well the other two values from of the right upper corner of the sheet, all stamps in the plate printing, upper margin perforations going through margins, on correctly franked registered cover from \"LEIPZIG 29.9.08\" to Amsterdam with arrival postmark. In this kind extremely rare and decorative! 4701 ✉ 91IIx 50 Pfg. 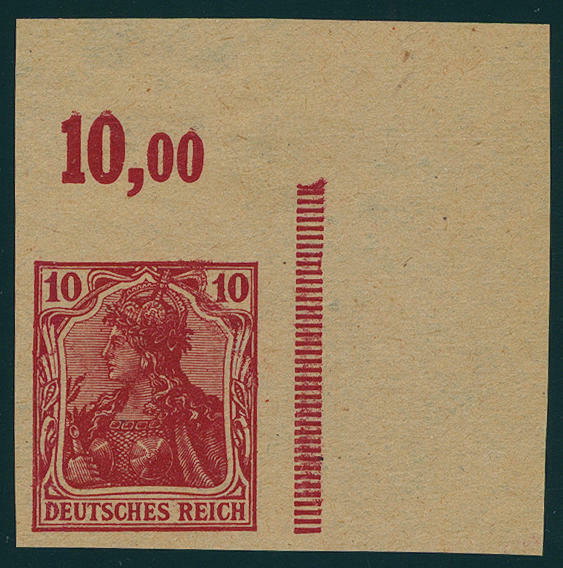 Germania, vertical strip of four as correctly franked multiple franking on a delivery envelope for submersible letters from \"MOCHENWANGEN 15. January 17\" with overprint \"submarine cover to BREMEN\". These delivery envelopes for the submersible letters are very rare and usually with the 2 Mk. Franked. As multiple franking of the 50 Pfg. Value is a rarity this attractive area!